Searington [misspelled] M.E. Church, 1788. Where George Washington has worshipped. 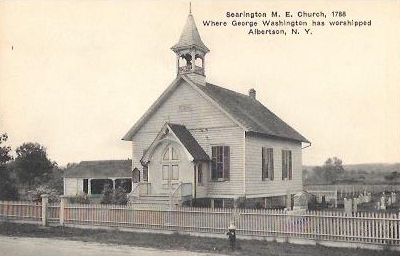 Albertson, N.Y. Published by the Johnsen Shop, Albertson, L.I., N.Y. Post Cards of Quality—The Albertype Co. Brooklyn, N.Y. 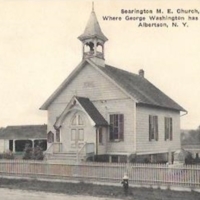 Published by the Johnsen Shop, Albertson, L.I., N.Y. Post Cards of Quality—The Albertype Co. Brooklyn, N.Y., “Searington [misspelled] M.E. Church, 1788. Where George Washington has worshipped. Albertson, N.Y.
,” Hofstra University Library Special Collections: Digital Collections, accessed April 21, 2019, https://omeka.hofstra.edu/items/show/1472.